“Aerials” is a general term for any of a number of performing activities that originated in the circus. 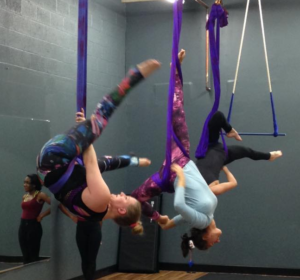 Aerials includes silks (also called fabric or tissu), lyra (hoop), rope, sling, hammock, trapeze (various styles, depending on how it’s rigged and used), and various other apparatus. Exploring aerials is a great way to work out, to build and tone muscle (including core! ), to increase cardio, stamina, and flexibility, and to have a great time while doing it! At Monarca in Flight, Northern Virginia’s first studio dedicated primarily to aerial arts, we’ll get you started with information on safely working in the air and guide you through grips, climbs, descents, and poses. As you progress in your training and become more proficient, you’ll learn inversions, drops, partnering, and much more. We cover multiple different apparatus so you can explore similarities and differences and find your home in the air. We offer both fitness and performance tracks to help you reach your particular goal. If your goal is to tone, build flexibility, and look great at the beach, follow our fitness track. If you want all that AND to show off your skills to friends, family, and supporters, go for the performance track to increase stage presence, body awareness, technique, and audience connection. Sign up for an intro class to see what it’s all about. We bet you’re going to love it!